Note: This post was originally published on TechCrunch here. The websites of most VCs have a stated investment thesis in SaaS, cloud, mobile, social or some combination of each. Are these really investment theses? Still? No, they’re realities, and this is worrisome. While SaaS, cloud, mobile and social have been drivers of big success for many funds and entrepreneurs over the past five years, theses-turned-realities cannot continue to drive outsized returns. Consensus bets have a tighter returns distribution, driven mostly by execution. Since execution is all about people, consensus bet returns are about “who.” Non-consensus bets have a longer tail distribution, driven by “who” but also “what,” “when” and “how.” By definition for non-consensus bets, the value proposition (what), adoption rate (when) and business model (how) are very uncertain. Both distributions are heavily right-skewed — most startups fail! But non-consensus bets can lead to huge wins when you get the who, what, when and how right. Think Facebook or Dropbox. Neither were consensus at the time, and they pretty much nailed it. If no longer SaaS, cloud, mobile or social, then what? I came up with the market thesis map below (click for PDF), which is sectioned vertically for B2B, consumer, healthcare and infrastructure because we work, we consume and we try to live longer, and infrastructure enables all three. 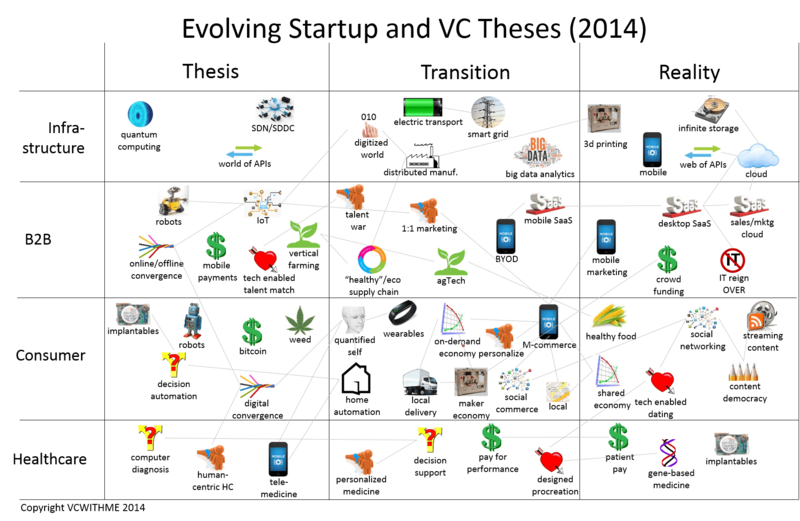 Left to right maps recent startup and VC investment foci along the continuum of Thesis –> Transition –> Reality. A true thesis yields bets that are non-consensus – visions of certain combinations of who, what, when and how that not everyone agrees on. Reality investment focus bets are consensus – just a question of who. As it turns out, many popular “theses” really aren’t theses at all. They’re realities. Connections proliferate among investment foci because very few technologies and business models are islands in the connected world. For example, 3D printing, an enabling infrastructure technology, has ties through distributed manufacturing into the maker and on-demand economy theses. There are also influential nodes like mobile commerce, social networking and IoT. Social networking is clearly a reality, not a thesis. The who, what, when and how of social networking are well defined. IoT, on the other hand, is still a real thesis because the winners, winning strategy and timing are still uncertain. Mobile commerce is somewhere in the middle. Outsized returns will be hard in social networking, likely (for someone) in IoT and possible in mobile commerce. Theses themselves evolve. When technology paradigms transition, there is always opportunity to rejuvenate a thesis. This is how SaaS (now a reality) spawned the mobile SaaS thesis (now in transition). The great paradigm changes we’ve seen in the last four decades are: Offline –> Mainframe –> Desktop –> Cloud –> Mobile. (Mobile may now evolve to Wearables –> Embedded. We’ll see.) The SaaS thesis developed 12-plus years ago when the desktop paradigm began transitioning to cloud, enabling the SaaS business model and creating monsters like Salesforce.com. Now with the mobile paradigm shift, there are big mobile disruptors in SaaS (like Base CRM) giving Salesforce a run for its money. So is SaaS as an investment thesis dead? Maybe not. Just as new technology paradigms can renew a thesis, one thesis can be merged with another to create a new one in a kind of combinatorial evolution. SaaS + Social Networking + Geofencing spawned our own investment in Geofeedia. Most theses also start out as horizontal plays; investors fund horizontal plays first because they can be really BIG. As examples, Salesforce, Hubspot and Dropbox are big horizontal industry-agnostic ventures. Once the horizontal bets have played out, however, there remain myriad opportunities to verticalize theses. This is especially true in lagging industries like construction, logistics and agriculture – hence our investment in FarmLogs. Nevertheless, the greatest returns will likely come from true non-consensus bets in new theses – when a brilliant team and lucky VC find the quadfecta of who, what, when and how. Note: for more on technology paradigm shifts and the combinatorial nature of technology, see Brian Arthur’s Nature of Technology and Nate Silver’s Signal in the Noise.